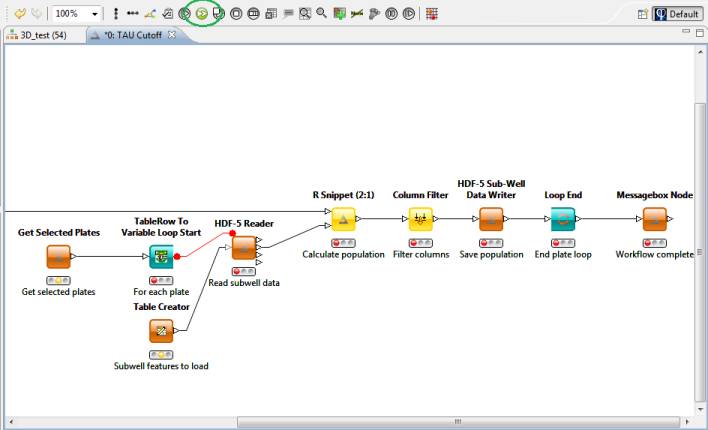 This addon contains a workflow engine, which allows you to execute workflows on a set of plates or experiments. Perform cell classification using a threshold on cytoplasm marker intensity. Calculate 'polished' features by applying a median polish algorithm on a plate. Detect key features by performing principal component analysis on a large set of features. Perform a custom data or curve fitting method using R packages. To install the Workflow addon, select Help > Install New Software. In the site list, select Phaedra Updates. Check the Workflow item in the addon list, and click Next. This topic explains how to run workflows. If you wish to design a new workflow, please contact a Phaedra administrator. 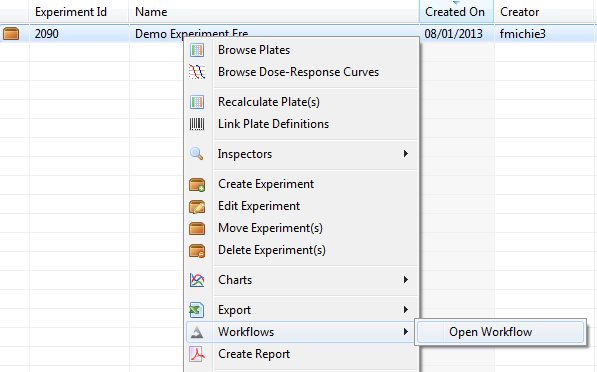 To run a workflow on a plate or experiment, right-click on it and select Workflows > Open workflow. 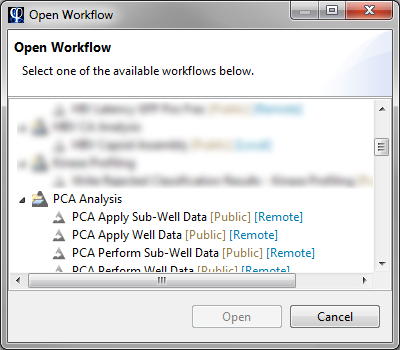 In the dialog that appears, you can select one of the available workflows. When you select a workflow and click Open, the workflow view will open. To run the workflow, click on the green Run All button in the toolbar (or press Shift + F7). While the workflow is running, the traffic lights of the workflow actions will change from red (queued)to green (completed). When all actions have been completed, a message will appear. At that point, you can close the workflow view. If Phaedra asks you to save the workflow, select No.